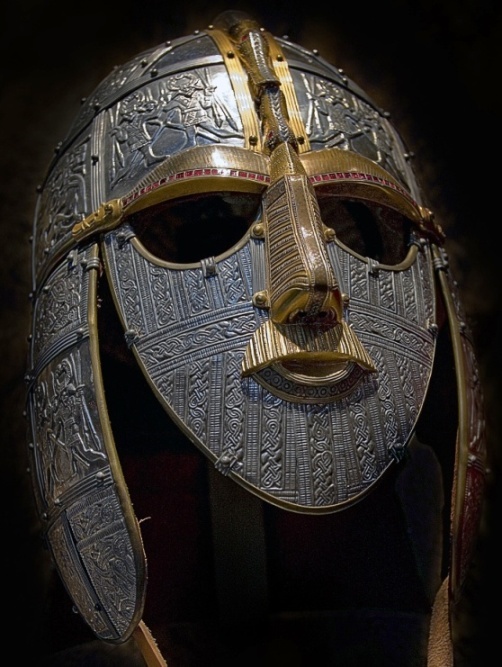 A replica of the Sutton Hoo helmet which was discovered in an Anglo-Saxon burial. At first, the Anglo-Saxons met large difficulties after their landing on the British shores and some of them had to return to their ancestral home in modern Germany. But after the alleged death of Arthur or the possibly historical military commander of the Britons that he represents (or the fall of the dynasty that he represents), they finally gained military superiority over the latter, conquering the lands that later became England. 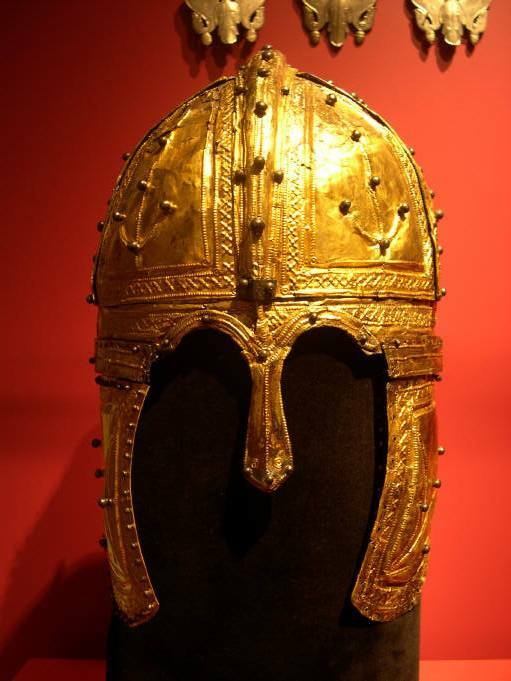 A Late Roman helmet rather of Persian distant origin, used also by the Briton inheritors of the Roman military tradition. If Arthur was an historical personality, he probably had his headquarters in contemporary Southwestern England, the land of the Dumnonii and their sub-tribes, where Tintagel and Cadbury are located. It is likely that he was a Dumnonian. However, many researchers believe that he came from other British regions, with the stronger versions being the ones of Wales and modern Northern England or Lowland Scotland (theory of a ‘Northern Arthur’). Concerning the opinions on the origin and the seat of Arthur (which are not as strongly supported by the existing data as that of Dumnonia), I will mention only the following: the legends on Arthur often connect him with Brittany (West Armorica) and the rest of Northern Gaul, while it should also be observed that the main directions of the Anglo-Saxon advance followed the British south coast and the Thames Valley. 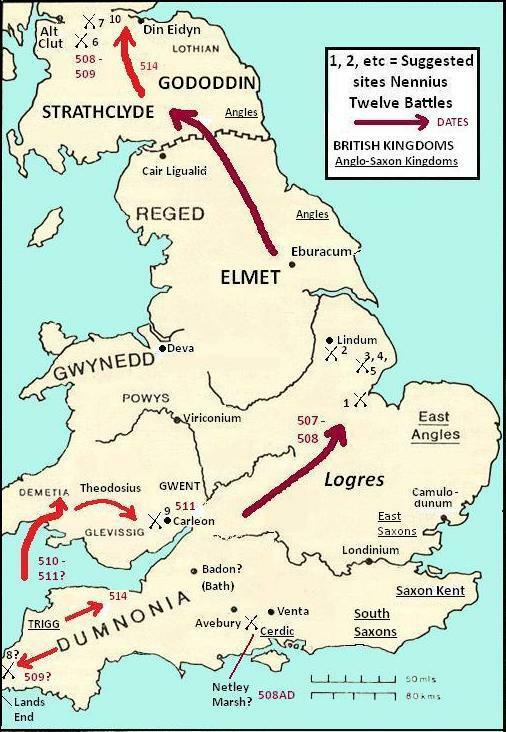 If Arthur resided in Wales or Northern Britain, it would be difficult for him to have frequent contacts with Gaul or restrain the “spearhead” of the Saxon invasion. According to Geoffrey, when Arthur campaigned in Gaul, he left Mordred, his nephew, as protector of his throne. Mordred usurped his power together with his queen, Guinevere. Arthur faced the usurper and his forces on the banks of the River Camel. In the bloody battle, all the knights were killed except three. Arthur and Mordred were among the survivors, then clashing themselves in a duel. 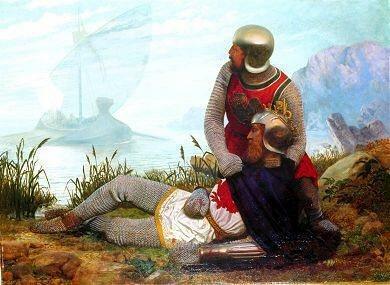 Arthur surprised Mordred and wounded him mortally. Before he drop dead, he managed to strike Arthur with a crushing blow on his face. After the battle, nine hooded women carried Arthur on a boat to the island of Avalon (Insula Avallonis), where he died. According to the Welsh legend, the king survived and still lives sleeping in a cave near Avalon, waiting for the right moment to return to his people and to evict the barbarians from Britain. Geoffrey seems to adopt the Welsh legend, because he does not mention that Arthur died. However it is recognized that if Arthur was buried somewhere, his grave was in the mythical island of Avalon, of unknown location. Map of suggested sites of Arthur’s twelve battles according to Nennius. The archaeologists have discovered graves of warlords of the 5th-6th centuries AD in some of the islands off the British coast. In 1998, they were excavating at the foot of Cadbury, where they discovered a tomb of a Celtic warlord of the Bronze Age, several centuries before the time of Arthur. The important point was that the chieftain was buried in a boat, which was significantly longer than the normal length of the boats of that period. The burial of the warlord in the boat is rather associated as a tradition and custom, with the much later voyage of Arthur in Avalon. The archaeologists have noted that the body of the warrior and the boat was aligning towards the hill Glastonbury Tor, which is located 10 Km away from the burial. Considering that Arthur and most of his men were probably Celts and worshippers of the ancient gods, it is possible that his journey in Avalon Island corresponds in fact to a burial in the same way, in a boat. The British Celts considered the islands as holy places, inhabited by the souls of the dead. That’s why they usually called them “Mona”, a name for holy places inhabited by souls i.e. spiritual places (similar to the Greek term “Mone” i.e. monastery; a spiritual place). In Antiquity, the Anglesey Island off North Wales, was called Mona. The Isle of Wight in Southern England, probably had the same name before the Romans name it “Vectis”. The Isle of Man in the Irish Sea was called “Monapia” from which the modern name originates. During the 1960s, the archaeologist G. Russell discovered at Glastonbury Tor, the remnants of an ancient path leading to the summit of the hill. The development of the trail was dated around the 3rd century BC, and it is considered that it was used for the rituals of the Celtic cults. Even today, Tor’s hill is considered “bewitched” by the locals – a memory for millennia of the frightening rituals that were taking place there. Tor’s hill is not an island (as Avalon is considered to have been) and it lies 26 km far away from the sea. However in earlier times it was giving the impression and the image of an island because it was surrounded by a floodplain due to the frequent flooding of the adjacent river. Today, channels have been constructed that drain the excess water into the sea, but until recently the water of the flood reached a height of 0.5 m. At Tor’s foothills lie the ruins of Glastonbury Abbey, which prospered during the period when Geoffrey of Monmouth wrote his History. A few years after Geoffrey’s death, in 1191, the monks of the Abbey claimed to have found Arthur’s tomb inside it. The tombstone of the burial had a cross, in which it was written in Latin that this Christian burial belonged to “King Arthur in Avalonia Isle” (“… inclitus rex Arturius in insula Avalonia”). King Henry II ordered the grave to be opened in 1278, in which the bones of a man and a woman were discovered. The bones and the cross were transferred in the church of the abbey, but later they disappeared without a satisfactory explanation. Only a sketch of the cross survived, but its creator was not considered reliable at his time. In 1959 the researcher R. Radford studied the remains of the tomb and his conclusion was that the claim of the monks of Glastonbury could not be supported by the existing data. According to the prevailing view today, the “discovery” of Arthur’s tomb was an invention of the monks, whose real purpose was to attract pilgrims to the abbey to gather the necessary funds for its reconstruction. The abbey was destroyed by fire, just seven years before the “discovery” of the tomb. An Anglo-Saxon seax (military knife) and its modern reconstruction. The main directions of the Anglo-Saxon advance followed the British south coast and the Thames Valley. There is also the political dimension of the probable fraud of the monks. During the 12th century, the discontentment of the Saxon (English) and the Welsh people for the Norman conquerors remained undiminished and the latter feared an uprising of their subjects. The Welsh tradition that Arthur was alive and was sleeping near Avalon, kept alive the flame of hope for their liberation, which was flared up more by Geoffrey’s History in the same century. Although Geoffrey was careful in adding anachronistically the Normans in Arthurian era Britain, in order not to offend them, it seems that ultimately he damaged them through his chronicle. The Welsh and the Saxons of his time have identified the Normans with the barbarians who will be evicted by Arthur when he would return to his people. 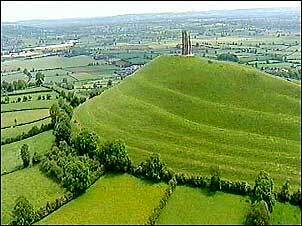 It was the Norman rulers who possibly had manipulated the “discovery” of Arthur’s tomb by the monks of Glastonbury. The goal of the conquerors was to “convince” the simple people who ruled, beyond any doubt, that Arthur was dead and there was no one who would defeat and expel them from Britain. The Normans projected themselves as “heirs” of the legendary king (also through the History of Geoffrey) in order to legitimize their rule. We can not reach any firm conclusions on the problem of Arthur’s historicity, however we can justifiably assume that a political and military leader, or a dynasty of warrior-rulers (Dukes) whose deeds were attributed to a single personality, lived around AD 500 managing to unite most of the Briton and Romano-Briton warlords and temporarily halt the Anglo-Saxon invasion (and the Irish and Pictish raids as well). It is likely that the name of this leader or the members of the aforementioned dynasty, was “Arthur.” Finally, it should be noted that Arthur belongs to a chronologically advanced age and it is not very possible to be the product of popular imagination, as his deniers suggest. Most of the evidence that enhance his historicity is anything else except mythological. Geoffrey Ash, one of the most qualified researchers on the Arthurian legend, remarked that the Welsh folk tradition that the king of the Britons remains alive and sleeping in a cave in Avalon waiting for the right moment to return, have its equivalent on several heroes of the Middle Ages, such as Frederick Barbarossa of the Germans (and Constantine Paleologos of the Byzantine Greeks). Ash rightly points out the fact that those medieval heroes are not mythical but historical, thereby the logical conclusion is that the same goes for Arthur.